Washington Square Press, 9781451688924, 400pp. To see is a trick of the mind, but to believe is a trick of the heart. Born to brilliant parents one thousand years after a great conflict known as The Mapmaker’s War, Secret Riven is an uncanny child who can mysteriously communicate with plants and animals. When her knowledge of an esoteric symbol brings unwelcome attention, gentle, watchful Secret finds acceptance from Prince Nikolas, her best friend, and Old Woman, who lives in the distant woods. 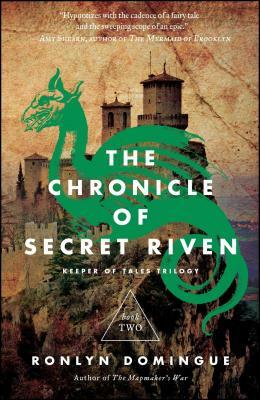 When Secret is twelve, her mother, Zavet, receives an arcane manuscript to translate. Zavet begins to suffer nightmares and withdraws into herself. Secret sickens with a fever and awakens able to speak an ancient language, in which her mother is also fluent. Suddenly, Zavet dies—and the manuscript is missing. The only clue left is a cipher for Secret to find. Soon, she will have a choice to make: confront a destiny tied to an ancient past or deny it, never to know its whole truth. “With the cadence of a fairy tale and the sweeping scope of an epic” (Amy Shearn, author of The Mermaid of Brooklyn), The Chronicle of Secret Riven is a spellbinding tale of love and adventure, myth and legend, fate and free will—and an introduction to an unforgettable heroine.